Hendersonville Muffler Company does a lot of exhaust repairs just to help our clients pass emissions tests. We replace catalytic converters and mufflers for our customers every day. We also have a huge number of people who just want their car to look cooler or sound cooler with high performance exhaust systems like this one for the Z-06 Corvette. which really does sound pretty cool. 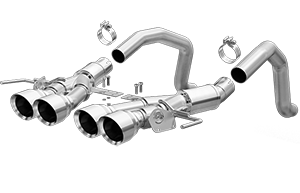 We carry exhaust system components from Magna-Flow, Flowmaster, Invidia, Walker and a few others. We also custom bend our own exhaust systems. We do muffler deletes, high performance catalytic converters, custom exhaust tips and hangers.